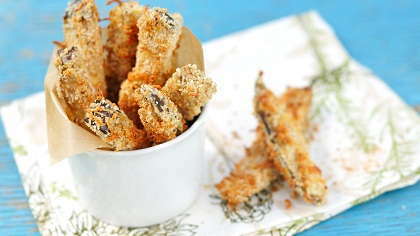 Follow this recipe for delicious and healthy (baked) eggplant fries! These kid-friendly crispy eggplant fries are baked in the oven and served with warm marinara sauce. They make a great healthy holiday appetizer or side dish for sharing. Whip egg whites with a fork until blended and pour into a large bowl. Toss eggplant fries in egg whites. Combine next 6 ingredients and sprinkle over eggplant. Place eggplant in a single layer on parchment paper on a baking sheet. Spray fries with non-stick spray. Bake in 425 degree oven for 10 minutes or until browned. Serve with warm marinara dipping sauce on the side.